Sometimes I just want something a little different to serve as a side dish besides the same old usual fare that I always make. Then I was reminded of this dish I had as a young married woman eager to learn all the tricks of the trade in the kitchen. I used to work in an Elderly Person Care Home for 15 years, and we had amazing cooks there, who cooked home made food that was familiar to the people that lived there. Fry chopped bacon until crisp; add onion and green pepper. Drain at least 1/2 the fat. Mix vinegar, seasonings and egg; stir into bacon. Stir in potatoes and heat through. 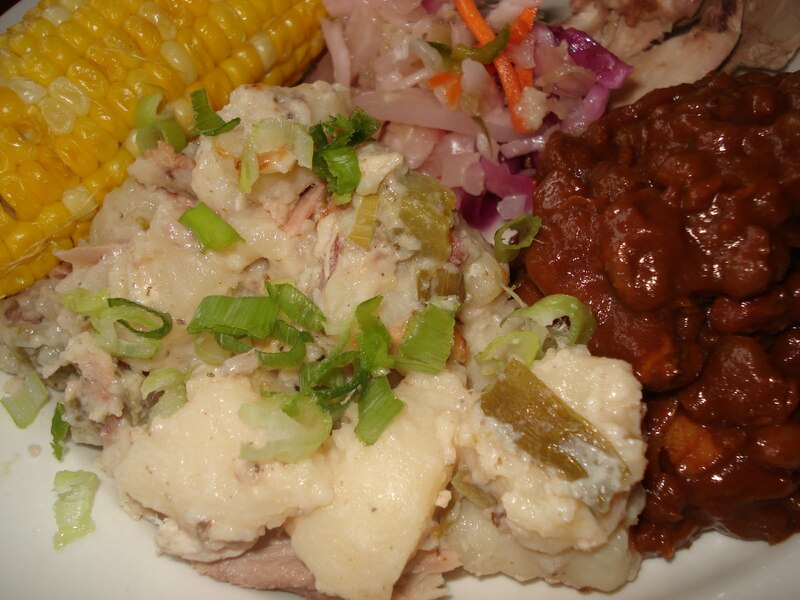 Enjoy with some smoked sausage or ham, cole slaw and baked beans. The recipe I have (from my German Grandma) is very similar to yours except that I use a little cornstarch to bind instead of an egg. Absolutely a "fave" in our house and such comfort food. Thanks for reminding me to make this....now that the season for warm dishes is upon us! No, there isn't, in fact! But because we add 'es' to pluralize it, sometimes people mistakenly think the singular has the e.
Oh Charlotte, this is a recipe I haven't made in ages. It's always a hit when I make it. Thank you for reminding me. It's great served with ribs. This looks delicious Char. I have never had hot potato salad. My grandfather was born in Salt Lake City, but his family was from Germany and lived there several times during his childhood. We always went out for German food on his birthday (Nov. 11th) and the hot German Potato salad was my favorite part of the meal. A couple of years ago I traveled for the first time to Germany, and to the town he was raised in. At the train station there was a small restaurant; I ordered a lunch and with my first bite of the hot potato salad my eyes filled with tears. It was like a flood of memories and I was re-living them in his ancestral city. Isn't it amazing how food can stir up good memories? This is somethign I've never made, but it sounds delicious. When can I come? This looks amazingly tasteful. I'm glad you posted that. I remember my MIL making that kind of salad. You didn't work at a care home in Vancouver, did you, Marine and Victoria? We lived a couple block away and would go down for their craft fair and buy a ton of this salad!!! I'm excited to find a similar recipe! Just remembered I'd left this comment so long ago. No doubt you never saw it then, but I'd love to know if this is the recipe....:) Thanks! No Natalie, I never did work for a care home in Vancouver, but I did for many years in Winnipeg. Sorry I can't tell you if this is the same recipe. I guess you will have to try it for yourself to decide if it is similar to the one you remember or not. We like it though, I hope you do too. Fry bacon and then stir in flour, add hot water, vinegar & sugar. Boil up and pour hot sauce over potatoes...if sauce is too thick, add equal parts of water or vinegar...or use less flour.